What is a New Hampshire Last Will and Testament? 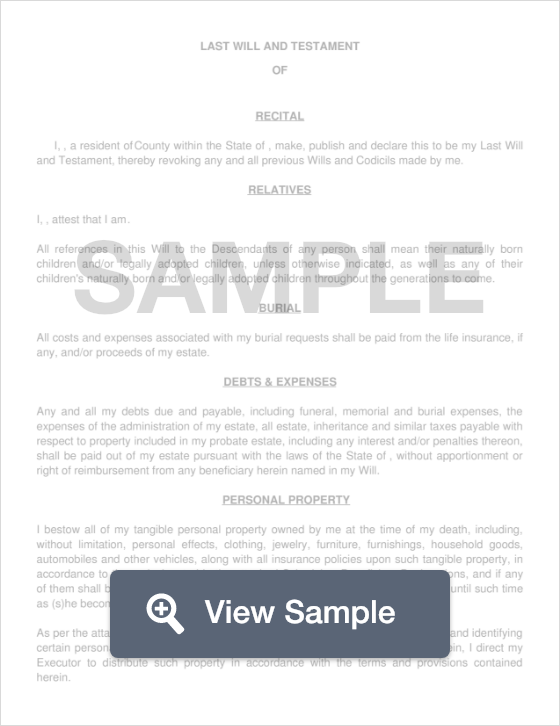 New Hampshire Last Will and Testament: What Is It? A Last Will and Testament is a legally enforceable document that allows someone (often referred to as a Testator) to pass their belongings to their beneficiaries once they pass away. A Will can provide specific details as to which assets will be passed to which individual, and can also go into detail about funeral home arrangements and last meal specifications. Testators can delegate exactly how much of their assets will be passed down to each individual beneficiary, and can even leave their estates to charity if they so choose. This document is legally enforceable as long as it is signed by two Witnesses and notarized by a Notary Public, and can be upheld in court if any disagreements occur. Witnesses - According to Section 3B:3-2, the Will must be signed by two (2) witnesses. Children - Children’s names, living status, and whether or not they will be named as beneficiaries. Step 5 - Would you like to set up a Trust for someone? Setting up a Trust for someone who requires special care can prevent any issues with their eligibility to receive other benefits like Medicaid. Step 6 - State the time period of your children’s inheritance. Step 8 - Provide any specifications for the last meal.